The gallery shows small images of the quilts including descriptions for quick access. The slide show shows detailed images, a single quilt per page. All quilts on this website are machine patched and hand quilted by Arnout Cosman. Don't forget to vote for your favorite quilt! 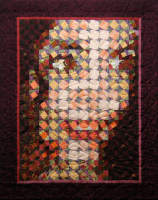 QuiltAssistant is free software for designing quilts based on photos and drawing pieced quilt blocks with ease. On the maps of The United Kingdom, Ireland, The Netherlands, Belgium, Luxemburg, Germany, France, Spain, Portugal, Italy, Switzerland Austria Denmark Norway and Sweden you will find the quilt shop you are looking for!